It’s a new year, so it’s time for a new you, right? Many of us want to improve our health as a new year’s resolution. 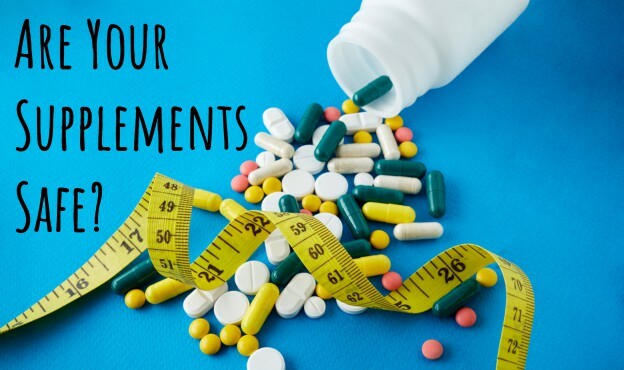 Nutrition stores stock their shelves with an array of supplements aimed at weight loss, enhancing muscle strength, increasing endurance, and improving overall health. It may seem like an easy way to achieve your goal, but are these products safe to use? Dietary supplements are NOT proven safe and effective by the Food and Drug Administration (FDA). Check with your healthcare provider before using a supplement. Some supplements can interact with your prescribed medications. Some supplements have studies to support a possible benefit, but most simply do not have good medical evidence to support their use. Since the FDA does not test these products in the same way as prescription and over-the-counter drugs, it is up to the manufacturer to ensure the quality and safety of their supplements. According to the FDA, “supplements are NOT permitted to be marketed for the purpose of treating, diagnosing, preventing, or curing diseases.” Most products have a disclaimer to talk with your healthcare provider prior to using the supplement, but how many people actually do this? Many supplements are made popular by professional athletes and articles in health magazines and blogs. Athletes involved in intense training or professional sports have a sports medical team to determine their dietary needs, but the general public does not have this close monitoring. This can result in a DIY diet with the general belief that “more is better”, which can lead to an accidental dietary supplement overdose. The list of ingredients found in supplements seem endless. They may contain vitamins, minerals, amino acids, herbs, and other botanicals. Supplements are available as tablets, capsules, liquids, and powders. Below are a few common ingredients found in supplements, for more information please check out this resource from the National Institutes of Health (NIH). Vitamins & Minerals: The Missouri Poison Center is often asked, is it possible to overdose on vitamins? The answer is yes. It is more likely to happen in people taking large daily doses of vitamins over a prolonged period of time, rather than a one-time accidental increase in dose. The symptoms of vitamin overuse are often subtle and can go unnoticed. Some symptoms include difficulty sleeping or concentrating, numbness and tingling of the hands and feet, and irritability. Protein: Protein is essential for building, maintaining, and repairing muscles. Strenuous exercise increases the need for protein, which is why some athletes turn to supplements. Supplements claim to optimize the muscle’s response to training and decrease the time it takes to recover. According to the NIH, there is no benefit to consuming more than the recommended amount of protein (which can be obtained through a healthy diet). Caffeine: Caffeine is found in coffee, tea, colas and energy drinks, but it is also included in many supplements, especially those targeted for weight loss. Sometimes it is disguised on the label under unfamiliar or alternative botanical names. Studies have shown that caffeine may improve exercise endurance, but it does not enhance strength. If you are using caffeine to help with athletic performance, the dosing needs to be done under the guidance of a medical sports trainer. Heavy caffeine use can diminish rather than enhance performance and can cause sleep disturbance, anxiety, and irritability. Creatine: Creatine is produced by the body and it is also contained in animal based foods such as beef and salmon. Creatine is stored in the muscles and provides them with energy. While creatine may enhance performance of intense short bursts of activity, it does not help with endurance related activities such as distance running and swimming. It may be safe for healthy adults to take over time, but it can cause water retention and weight gain in the long term. Some individuals report other side effects such as GI distress, muscle stiffness, and cramping. In general, the NIH concludes few of the dietary supplements available might enhance performance when they are added to (not substituted for) a proper dietary foundation. For teenagers, the American Academy of Pediatrics (AAP) believes that performance supplements do NOT improve the abilities of teen athletes beyond that which occurs from proper nutrition and training. Be sure to let your health care provider know about any supplements you are taking. There are some medical conditions where a certain supplement may be contraindicated (meaning ‘do not use’). Many supplements interact with medications and can either decrease their efficacy or increase the risk for side effects. If you are not sure, call the poison center to check if there are any documented interactions between your medications and any supplements you are taking. As mentioned above, supplements are NOT proven safe and effective like prescription or over-the-counter medications. Due to significant side effects observed over time, the FDA has prohibited the sale of androstenedione, dimethylamylamine (DMAA), and ephedra in supplements. These ingredients have been found to be unsafe, and there is no scientific evidence showing they improve performance. These products can be as dangerous as medications in the hands of young children. As with all prescribed medications and over-the-counter products, safe storage is just as important for dietary supplements. The containers do not usually have child resistant packaging, making them very easy for a curious child to access. In fact, from 2005 to 2012, calls to poison control centers across the country increased by 50%, and 70% of the exposures were in children younger than 6 years old! If you have questions about vitamin toxicity or supplement overdose, call the Poison Help line at 1-800-222-1222. Specially trained nurses and pharmacists are available 24/7/365. The service is free and confidential.